Show of hands: how many of you hate having to get out of a bunker? Probably a good amount of you. Most people don’t like bunkers, but it’s not as bad as we make it out to be. Make the jump to learn how to escape bunkers! Really, you want me to do what?! Honestly, it’s really not as difficult as we make it out to be. Let’s take a look at both green-side and fairway bunkers. There are the ones that usually cause the most frustration. You’re really close to the green, which many think “I don’t need to swing that hard”… but that’s in normal conditions. You have to swing a little harder. Why, you ask? Because we aren’t actually hitting the ball. Not from fluffy sand, anyway. When in that kind of bunker, we’re actually going to hit the sand first! Seems counter-intuitive, I know. We’re always told “ball-then-turf” contact when on the fairway or rough, but the opposite is true when we’re trying to escape a greenside bunker. First off, open your clubface. The shorter the shot, the more you need to open the face. Be sure to physically rotate the club and replace your hands… too many spin it open, then grip it so that it returns to square once they take their stance. Don’t be that golfer. Open your stance. Not just your feet- your whole body. How open your stance is is relative to how open you made your clubface. The more open the face, the more open the stance. Dig in. Dig your feet in. An inch or so is good. Set your weight on your forward foot. We don’t need leg action- not like on a regular shot. We want the upper body to drive an escape shot from the bunker. The general rule is to throw a cup full of sand out with the ball. 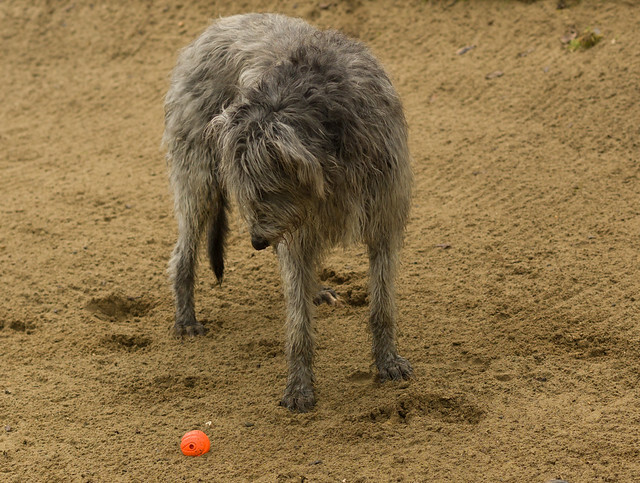 That’s what’s actually pushing the ball towards the green: the sand. Our club’s face never actually even touches the ball! Ever hear of a fried egg lie? Now, all I need is some pepper! You know, when the ball’s buried in the fluffy stuff? There’s one modification to make. Instead of opening the clubface wide, we close it down. The reason is, per short-game guru Dave Pelz, is the sand will force the face open through the ball, which will allow us to not just extricate the ball from its buried lie, but send it flying on that pillow of sand like a normal bunker shot. It isn’t that way from hard sand. Honestly, even I tend to have trouble still from this situation, so don’t feel alone. The technique that works the best for me is to play the ball more like a chip. I don’t dig in, just set up like a normal chip shot. I want to get a little into the sand, which because it’s made of metal and the bunker is made of sand, shouldn’t be that big of a deal. Normal ball-then-sand contact. I also shy away from using my sand wedge; I don’t need the extra help the thicker sole and high-bounce angle of the SW gives when the sand’s soft. I’d rather have less bounce so I don’t risk skipping the club off the bunker’s surface, hit the ball above its equator and blade my shot. That would make me a sad Justin. So, if I’m close to the green I’ll use my LW, if I’m farther away I’ll use my GW or PW. Getting out of fairway bunkers isn’t as bad as we may make it out to seem. You want to dig in a little, like in a greenside bunker, but you don’t want to go too deep. Just enough for some stability. Don’t open the face, and you don’t have to open your stance too much, if at all. You do want to make sure you have enough club to clear the lip of the bunker. I tend to favor going up one club from my normal distance. So, if normally I’d need, say, a seven iron, I’m going to use a six from a fairway bunker. The amount of trust you have in this, as well as your ability to execute, will really determine which club they’ll need. For some, it may be the five iron that gets them there. Remember there’s a point of diminishing returns; if you’re so far away the club you end up needing is such that it isn’t enough to clear the loft, there’s no shame in laying up. Stick your next shot close and one-putt to save par! Really, that’s it. Don’t be afraid of shots like these. The biggest thing, I think, is the mentality: don’t think of them as “sand traps“. They aren’t “traps”… they’re bunkers. You can get out of a bunker, just follow the steps I’ve given to get you there!